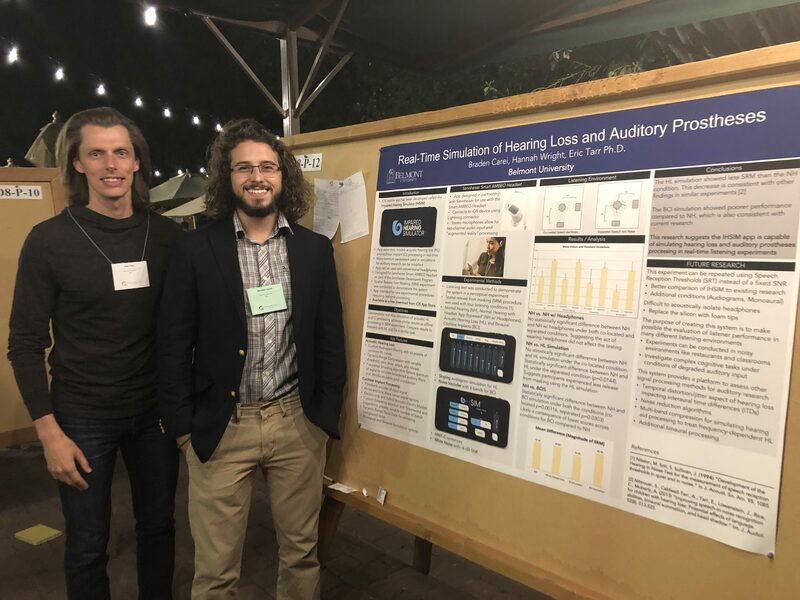 Dr. Eric Tarr, assistant professor of Audio Engineering Technology (AET) and Braden Carei, AET and Computer Science student, presented at the 2018 International Hearing Aid Conference in Tahoe City, California August 15-19. Their poster, titled “Real-Time Simulation of Hearing Loss and Auditory Prostheses,” demonstrated an iOS mobile app which models hearing aid processing for perceptual research experiments. The app is called the Impaired Hearing Simulator (IHSIM) and is available in the iOS App Store. It has already been adopted by researchers at the University of Maryland for an experiment investigating the perception of speech under degraded listening conditions. The app was developed as part of the Belmont SURFs program. For his work, Carei was selected by the conference to receive a student travel scholarship.